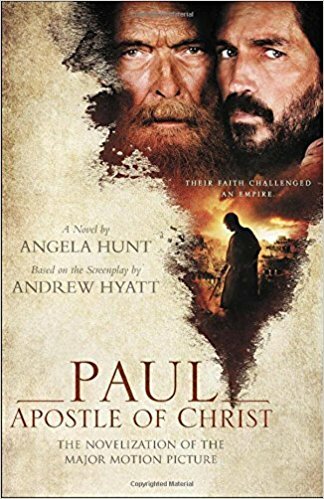 To coincide with the release of the movie, Andrew Hyatt's screenplay has been transformed into a novel by writer, Angela Hunt. In full disclosure, I have to admit that I've never read a novelization of a screenplay. I've read lots of novels that have been made into films, but never the other way around. novel based on a film based on Scripture? As I started reading the novel, the first difference that struck me was Paul's prison cell. In the movie, it's a dark subterranean room, entered by a narrow staircase, and punctuated by shafts of light from above. In the novel, the full scope of Paul's desperate situation becomes clear to us. His cell isn't a room, but hole in the ground. Instead of stairs, the only point of entry is a rope, which is raised and lowered only at the will of his guards. We're given vivid descriptions of the darkness, dankness, and sheer torture the room provides. As with any novel, Hunt is able to investigate the details of the world in ways that film can't do. For example, we learn more about Nero, Rome, and the political tensions of the day. At the end of the novel, Hunt provides an "interview" with some interesting behind-the-scenes info, including some of the research she poured into the book. As with any artistic interpretation of Scripture, the novel has some stretches of imagination. Hunt also addresses these in her interview, sharing her reasoning behind these choices. I think, ultimately, there's a real value in creating novelized or filmic versions of Bible stories. Sometimes, we can get so lost in the familiar words that we forget the humanity of the stories. We can lose sight that, just like us, these people had to cook dinner, make a living, care for family, and maybe even have a laugh at the end of the day. Translating these stories through art helps to make these details vivid and real. We are able to see God working in the every day, calling ordinary people to extraordinary things. It's hard to know whether I'd recommend the film over the novel or visa-versa? I think the advantage of having both is that it makes the story available to so many people. You can approach this story in the vividness and immediacy of a film, or you can curl up with the book and spend hours chewing over every detail. which makes his ministry all the more amazing. As the tagline for the novel reminds us, "His story will change the world..."
Baker Publishing Group and Graf-Martin Communications, Inc."